Meet The SkyQueen CEO Millie Hernandez-Becker. Need advice on running an airline or purchasing an airplane? Talk to Millie Hernandez-Becker. She knows the business firsthand. 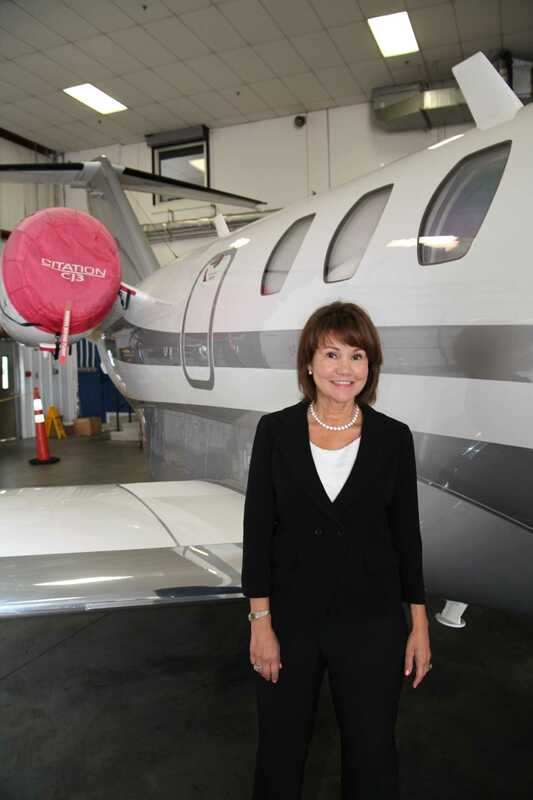 Hernandez-Becker is the president and CEO of Skyqueen Enterprises, and the former owner of Westchester Air, a regional charter company based in White Plains. During the 1990s she managed and developed Westchester Air with her husband. After his death in a plane crash she successfully ran the company before ultimately selling it for a profit in 2005. Now she advises fleet owners, individuals and major airports looking for cost-effective solutions to a wide variety of aviation challenges. With over 30 years of experience in the air industry she is one of those leaders who learned the business from the ground up, and is paying it forward by helping future business leaders. She was recently honored by the not-for-profit group Women’s Enterprise Development Center (WEDC) which helps female entrepreneurs build successful businesses. Leveraging Skyqueen Enterprises and her own expertise in business development and operations, Hernandez-Becker is an adviser to private equity firms Goldman Sachs and The Carlyle Group. Her client roster also includes Flex Jet and Million Air. Entrepreneurship is in Hernandez-Becker’s blood. Her father owned a string of bodegas after emigrating from Puerto Rico. Ultimately, he sold them to start his medallion taxi business, giving Miller the first step in her new career direction. How did you get interested in this type of business? I remember growing up in New York City and my dad would drive passengers to JFK airport. I would always ask to go to the airport with him. Aviation was glamorous in those days, and who didn’t want to be a part of that? What was your first job in the aviation business? My first job was assistant to the vice president of operations for New York Air. Our biggest competitor was Eastern Shuttle. My first assignment was to watch what the competition did for one week and report back. I looked at the turnaround for getting from the gate, to getting the plane in the air. It became a marketing campaign and we did a commercial about being faster than our competition. I understood the value of on-time service. How did you become so successful in your field? I always looked to learn more. I was a ticket agent, flight attendant and assistant to the vice president. For the first five years I learned the airline operation. To become a leader you need the experience, a willingness to learn and become a brand. People look for a promise to deliver a product. Why do they call you Skyqueen? It was a nickname given to me by one of the pilots from Westchester Air, because I was taking care of everything. It was my handle and it stuck. When I incorporated my business I decided to use it. I get up at 5 a.m. I pray and meditate. I visualize my day ahead. I get my son ready, make phone calls. I’m organized and a planner. I think you have to think things through to make them happen for you. What do you need to be successful in business? You need three things: A good lawyer, a good accountant and a good partner in home and in business, someone you can trust. Women don’t necessarily learn business automatically, but must be at the table. Have there been challenges in being a woman in this field? I’ve never thought about it, being a woman; it was more about my experience and knowledge. It’s been an advantage, men are respectful and able to take direction. As a female CEO the hardest thing is getting access to capital. Be the best you can be. Be presentable and smile. Protect your brand and your reputation. You don’t know where it will take you. JetEquity, a charter/management company based at Westchester County Airport (HPN) in White Plains, N.Y., has launched into the line-service business with the acquisition last month of HPN’s first FBO–Skyport. “We plan to renovate the existing hangar and office complexes,” said JetEquity v-p Brian Ciambra. According to JetEquity v-p of sales and marketing Millie Becker, the company intends to acquire more FBOs. For the near future, Skyport will retain its name and be run independently of JetEquity’s charter/management operations and facilities at HPN.